By Asif Fuard and Pushpakumara Jayaratna, Pix by J. Weerasekara. The Kurunagala town was buzzing with life on Thursday but it was not due to the elections. Rather, it was people doing last minute shopping for the Avurudu season. There were more people in the market place than at polling booths. It seemed like an ordinary day where people attended to routine shopping, selecting items of clothing, purchase of new pots, pans and food items from the Kurunegala town market. Most residents were either disinterested in the elections due to the timing of the polls, while many were fed up with the electoral process. Madhushanka Ariyadasa, a vender selling clothes in a corner at the market said he was fed up with voting and had lost faith in all political parties. “I have lost faith in most of the leaders representing us in the Kurunegala district. They don’t have any principles. Most of them join politics to fill their pockets. They don’t care about what we are going through. I decided not to vote mainly because I have to continue my business to make a living. If I go to vote I’ll be wasting time and losing business,” he said. Jindasa Gamalath a vegetable vendor said he had given up on politicians since they had abandoned the people of the district. “I have given up on politicians, they are not sincere. We have so many issues and they have not done anything to solve our problems. The only time we get to see them is when elections are near. We feel abandoned by them and they turned a deaf ear to our problems. The only thing they care about is coming into power,” he said. Jeewaka Silva a trishaw driver said he didn’t vote because he felt politicians in Kurunegala change their political views to suit their personal needs. “How can we think of elections when the cost of living is so high? politicians come into power but they don’t look into the wellbeing of the people. I have canvassed for so many politicians during my time. When they come into power they forget about us completely. I didn’t vote for any candidate because they tend to change their political views for their personal gain,” he said. Nelum Sumanadasa a house wife said she was the only person in her family who voted. Unlike in previous years, enthusiasm to vote has deteriorated. “I cast my vote and came direct to the market to do some shopping for the family before Avurudu. My husband and my parents didn’t vote because they have lost interest in elections. It is just like any other day here. No one is interested in politics and what politicians have to say,” she said. Abdul Samad a cashier at a wayside restaurant said people in the area don’t have the fervour seen at past elections. “People are just not interested. Some are disgusted with politicians and their false promises. There is no election fever as in the good old days. Earlier Election Day used to be like a carnival. But now the election atmosphere is dead,” he said. On the outskirts of Kurunegala town however people had a different view. Some had decided not to vote due to the intra-party violence taking place. A person who spoke to the Sunday Times on grounds of anonymity said the community in Kurunagala was totally disgusted at the level of violence taking place. “We have seen too much violence during the past 25 years. Now the war is over, we are in an era of peace, yet we see people from the same political party fighting to get preferential votes. How can we have confidence in candidates from the same party who are trying to kill each other for votes? It clearly shows that they are hungry for power,” he said. 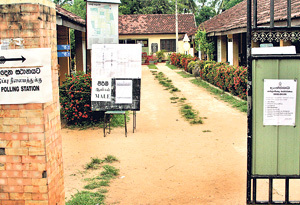 Polling stations in the Kurunegala district remained empty as voters expressed their disgust at polls related violence. 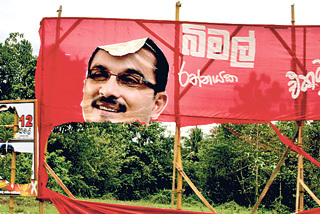 Amidst the cutouts, posters and party flags that were flying high in certain parts of Kurunegala, white flags were flown at almost every house in Reedigama. Posters and banners containing messages of condolence were seen in almost every corner of Reedigama, a few miles away from the Kurunegala town. Last week a 22-year-old supporter of the UPFA was shot dead while participating at an election rally. The assailant who is still at large was reported to have shot the victim on his face with a shot gun. Police suspect the killing was linked to intra-party rivalry. Shops in the area were closed on election day and many in the area were said to have boycotted the elections as a mark of protest. Chandra Somasundara a shopkeeper said “most people in the area are very angry over what happened. I have closed my shop today as a mark of protest. People here haven’t gone to vote because of this incident”. Kamani Sudarshini also from Reedigama said, “residents in the area have lost faith in politicians in the light of the incident (killing) and many who are still angry about it decided not to vote. “Most of us are very sad about what happened. This can happen to anyone. That boy died because of elections and politicians. Politicians should be held responsible for these incidents. If they are true leaders and care about the people they would make sure this type of incidents do not take place” she said. According to election observers the level of violence on polling day was less than in previous years. However a few isolated incidents were reported to have taken place. 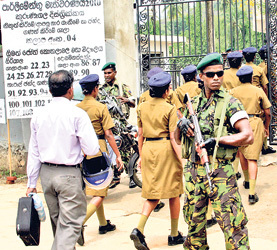 At the Almina Muslim Maha Vidyalaya a polling booth in Ibbagamuwa, voters were chased away by the UPFA candidate Salinda Dissanayake. There were also reports of three vehicles being smashed after supporters of UPFA candidates Salinda Dissanayake and Johnston Fernando clashed at Melsiripura. The matter was said to have been eventually settled amicably.